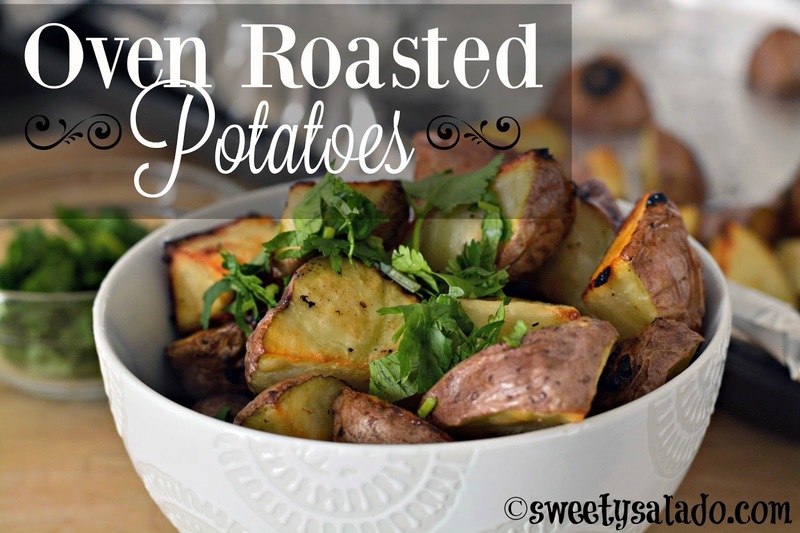 Today I bring you another delicious side dish, oven roasted potatoes. Once they come out hot from the oven, they’re crunchy on the outside and tender on the inside. 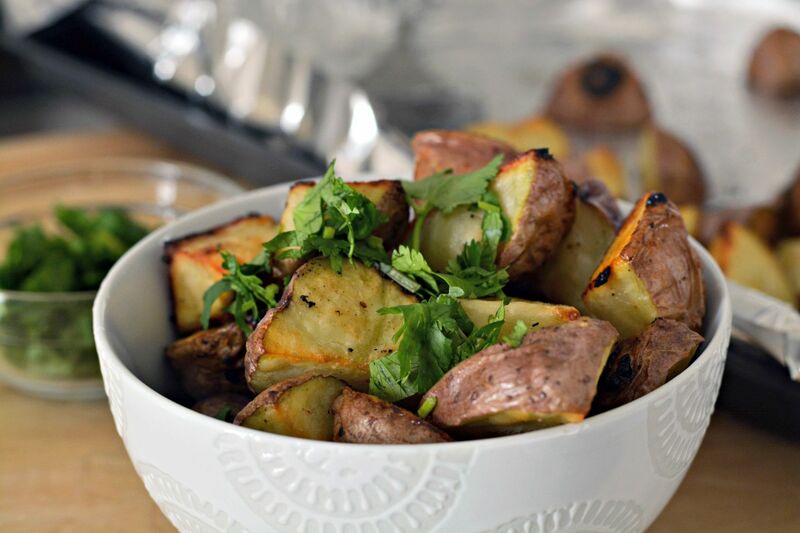 If you like potatoes, then this is the perfect recipe to make, and on top of that, it’s way healthier than making fried potatoes. I’m not sure if I had told you this before, but my sister is one of those people who will die for anything made with potatoes, she simply adores them. And whenever I make this recipe, I always have to make a bit more so she can have her way with them. And as with any other potato recipe, this side dish goes well with any other type of food you’re serving. Or, if you prefer, you can serve it alone with some Colombian hot sauce or green hot sauce. Rinse and dry potatoes really well. Cut them in half or in quarters. In a large bowl, mix olive oil, garlic, salt and pepper. Add the potatoes and toss them well to coat them with this mixture. 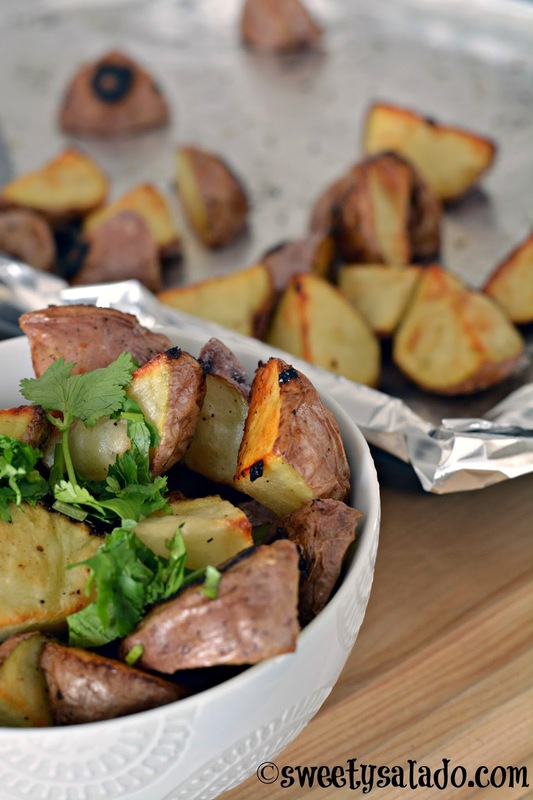 Place the potatoes on a baking pan and roast them for 45 minutes to an 1 hour, or until they're golden brown. Makes sure to toss them half way during cooking to make sure they brown evenly on all sides. Remove them from the oven, sprinkle with cilantro and serve immediately. Looks delicious! And just want to say THANK YOU for your blog! My 2 yr old is partly Colombian and I want to raise him with some of the Colombian traditions. I was having a hard time finding traditional Colombian recipes in English until I came here. Can't wait to try your recipes for natilla and bunuelos. We'll be trying that this holiday season when we host my (North American) family for dia de las velitas.